Freshman forward Alfred Perez runs in celebration towards fellow freshman forward Alex Debayo-Doherty. Freshmen Alfred Perez and Nico Garcia-Morillo grew up playing youth soccer in the same region of South Florida. They met in middle school, and played both with and against each other at various times throughout high school. Each has had an illustrious career up to this point at every stage of the game, and each has even represented the United States national team at the youth level. 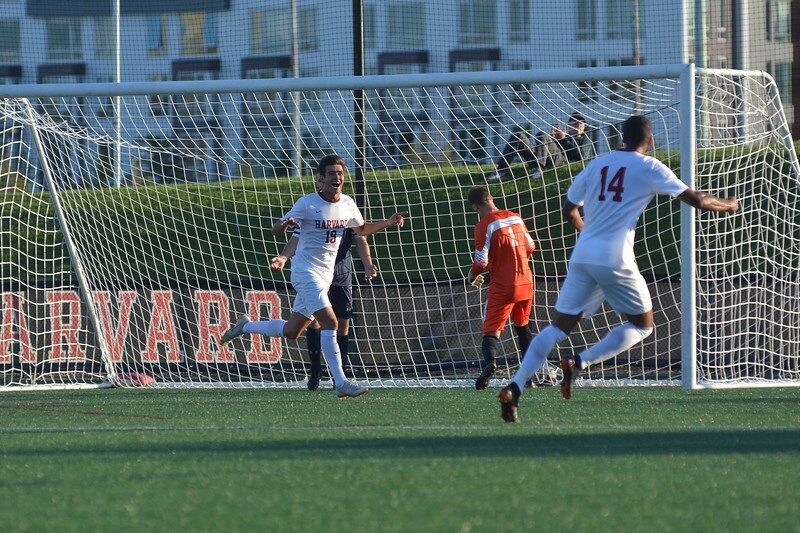 Now, after so many years spent in the same soccer-related circles, Perez and Garcia-Morillo play together at Harvard and look poised to continue their success at the college level. It hasn’t taken long for Alfred and Nico to make an impact on behalf of their new team. The two have appeared in a combined 17 games for the Crimson so far this season—Perez has tallied three goals, while Garcia-Morillo has chipped in with a goal and two assists. Statistics aside, the freshmen have made quite the impression on their more experienced teammates as well. Senior captain Sam Brown mentioned how impressed he was by the level of skill that the two freshmen brought to the team this season. Despite their abundance of individual talent, Perez and Garcia-Morillo put the success of the team above all else. When asked, for instance, whether his first career goal or his game-winner against Yale meant more to him, Alfred didn’t hesitate to answer. Alfred and Nico have been able to acclimate so well to the new environment of college soccer because their unique experiences with the sport in the past have prepared them well. Interestingly enough, Perez’s father played for the Houston Astros in his younger years, and the impact that his career made on his son was a positive one. “My dad, being a professional, always taught me to be professional,” Perez said. Garcia-Morillo, too, learned first hand about the demands of playing sports at their highest level when he played for two years in the Atletico Madrid youth academy. He was quick to emphasize the more intense nature of the game overseas. “It’s just something you dream about as a kid,” Perez said. The transition to academic and social life at Harvard has also been fairly smooth so far for these two freshmen. Garcia-Morillo, a resident of Wigglesworth, has enjoyed meeting interesting people from all over the place in college, and he praised the school’s general culture. Furthermore, Harvard has given them a great chance to pursue their interests beyond soccer. “I’m interested in, in the future, maybe becoming a lawyer, attending law school, and taking after my father,” said Perez, who lives in Matthews. “I’m majoring in economics most likely,” mentioned Garcia-Morillo, noting that he’s also comping the Harvard Investment Association to learn more about finance. In their short time here at Harvard, Alfred and Nico both already feel that they’ve learned a lot from their teammates and coaches and that they’ve made significant improvements as players. “I’m way more fit than I’ve ever been,” Perez stated, mentioning how the physical demands of college soccer have forced him to work harder than ever. Garcia-Morillo agreed that the biggest adjustments have come in the physical aspects of the game. Although Perez and Garcia-Morillo find themselves focused primarily on the success of their team this year and in the future, senior captain Sam Brown offered some important advice for them to heed along the way. For Perez and Garcia-Morillo, whose chemistry with their teammates and with each other is immediately evident on and off the pitch, finding a way to have fun along the way to those coveted Ivy League titles should not prove difficult. The future of these two freshmen, and of the Harvard soccer program which they will help to lead, appears bright.